Press Room - FAR - Farhat Office & Co.
A Collaboration Agreement was signed in Amman between the Arab Society for Intellectual Property and the Arab World Institute for Professional Certification, Dubai, in order to work together to launch specialized training courses in the areas of intellectual property as one of the vital and important things in different sectors of life for individuals and institutional fields. The Arab Society for Intellectual Property is one of the most important houses of experience in the field of intellectual property on the Arab and international level due to its active role and international stature in this area and under the Convention, to provide integrated training courses in the areas of intellectual property for individuals institutions and the highest educational and training world followed with styles. Dr. Talal Abu-Ghazaleh, Chairman of the Arab Society for Intellectual Property, said that they will develop mechanisms and approaches to education and training in this area because of its growing importance in achieving economic and political renaissance States that incubate intellectual property laws. As part of the agreement, it will promote cooperation between the two sides to start training courses in the city of Dubai, where it was agreed, on the inclusion of “Arab Certified Intellectual Property Expert” program—one of the most important titles in the training programs—to be held. Expert Consultant Mr. Mohamed Farahat, head of the Arab World Institute for Professional Certification, resides the important role played by the society at the regional and international, especially in the area of professional development levels. Mr. Bilal Al Abdulla CEO of Al Faraj Training—Qatar (left) and M. Farahat CEO of AWI (right) negotiate partnership and collaboration. Mr. Abdulhadi Ahmed Almansouri, President of Arabian Society for Human Resources Management, in a business visit to the Arab World Institute for Professional Certification (AWI) in Dubai. 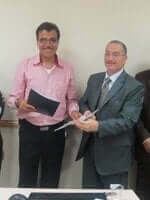 Mohamed Farahat CEO of the (AWI) welcomed him. Mr. Med Jones (left), President of International Institute of Management (IIM)—Las Vegas, USA, in a visit to the Arab World Institute for Professional Certification (AWI) in Dubai. 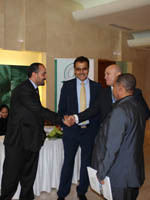 Mohamed Farahat CEO of the (AWI) welcomed him. Eng. Mr. Yusuf Fraihat, CEO of Jordan Academy for Quality Management—Amman, Jordan, in a business visit to the Arab World Institute for Professional Certification (AWI) in Dubai. Mohamed Farahat CEO of the (AWI) welcomed him. Arab World Institute for Professional Certification (AWI) participates in the “Sixth International Annual Forum of Legal Experts in the Islamic Finance Industry” held in Jumeirah Beach Hotel, Dubai. 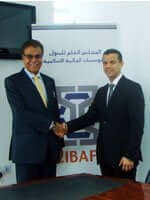 Congratulations to Farhat Office & Co. and LMC (Lootah Management & Consultancy) for signing their partnership agreement. We wish for both companies further prosperity and success. Two-day training program, training accountants and court experts in relation with the financial disputes. 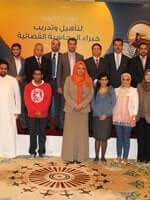 The program was conducted by two professionals, M. Farahat and Doctor Magdi Qasim, and covered the legal and technical aspects and relations to the court experts assignments in principle and in process.